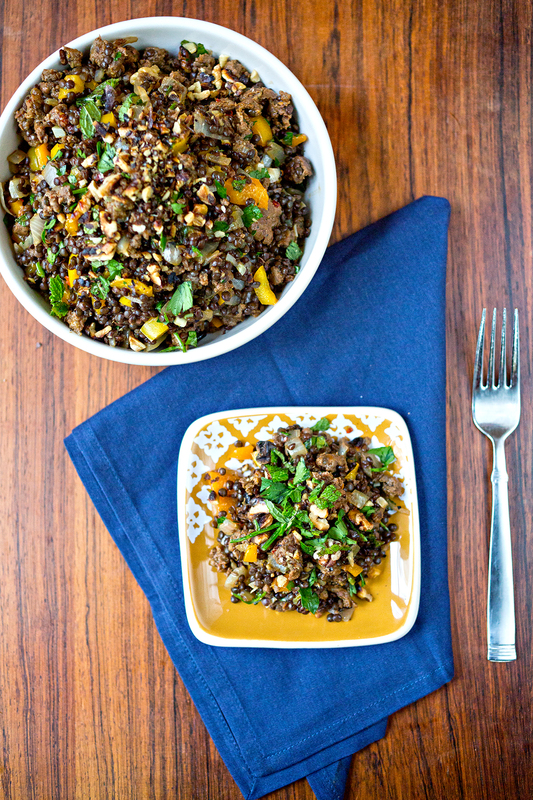 I found this lentil salad recipe over at The Kitchn and, given my love for this legume, had to try it. But, as the busy-ness of the holidays sets in I really can’t justify cooking unless it’s for my blog. The answer? As always, stuff some venison in what would otherwise be a perfectly lovely vegetarian recipe. This is a great make ahead to bring to work for lunches or if you want something a little lighter for dinner. At some point I ended up throwing some on top of some sautéed kale and it was really really good. At that point, all you need is a side of quinoa and berries for dessert and you’ve had ALL the super foods in one meal! The best thing about this recipe is that it’s reasonably healthy but also filling and comforting. If you want to be extra health conscious leave out the yolks and/or the parmesan. From the original recipe, I took out the sun dried tomatoes. I’m just not a fan, I can’t quite put my finger on it. I thought of replacing them with something else but nah – the recipe went just fine without them. Instead, I decided to richen up the whole thing by tipping in a few egg yolks, a technique I’ve stolen from pyttipanna. The heat of the dish gently cooks the yolks just enough as you toss it, making the dressing extra rich and giving it some thickness. If you’re opposed to the egg yolk thing for whatever reason you can certainly leave it out. My last note concerns the lentils. You really want them al dente for this recipe, with a good little bite, especially if you’re planning on having leftovers. Al dente lentils will hold up to the dressing in the fridge without getting mushy for about 4 days (which is really about as long as you want to keep it anyway). 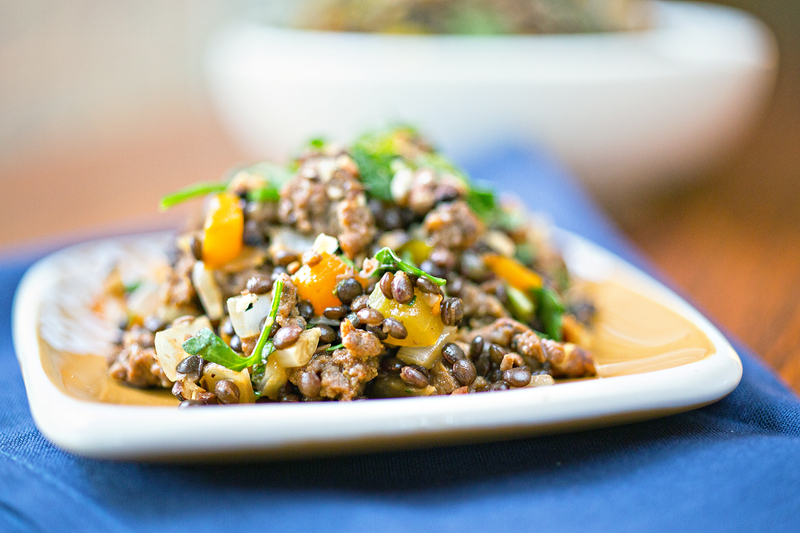 Cooking times can vary greatly depending on how old your lentils are, so keep an eye on them and taste along the way when you are getting close. Non game substitution: Any Italian sausage, or a chicken sausage would also be really good in this. Vegetarian substitution: Just leave out the meat! Leaving out the yolks and cheese also makes this vegan. Rinse the lentils and combine them with the water/broth. Bring to a boil, then simmer until tender but not mushy, about 30 minutes. If the cooking liquid starts to dry out, add more. When cooked, drain off the water and let cool to room temperature. Meanwhile, in a large skillet over medium high heat, take the sausage out of the casings and cook, breaking apart as it browns. Once brown, add the onions and peppers with some salt and pepper to taste and cook, stirring occasionally, until soft. Then add the garlic and lemon zest and cook until fragrant. Whisk together the lemon juice, olive oil and pomegranate molasses. 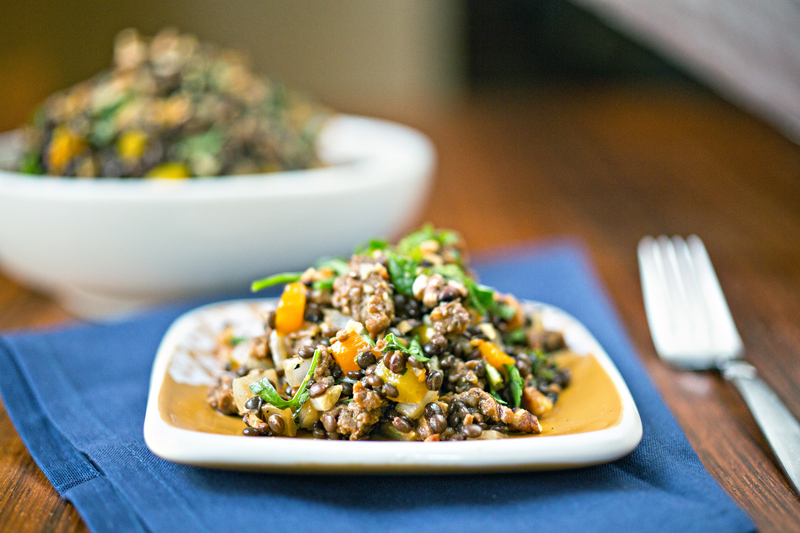 When all the meat and veggies are done cooking, combine them with the lentils in a large bowl. Add the dressing and two egg yolks (they will cook enough in the warmth of the dish) and stir until everything is dressed. Taste, season again. Top with parmesan and server warm or room temperature.